Mumbai (PTI): After a lifetime under the arc-lights, Indian cinema icon Sridevi was on Wednesday given a send-off fit for celluloid posterity with surging crowds of mourners walking with the cortege as it made its slow way through the city and thousands more glued to their television sets to watch her last rites. The 54-year-old actor, whose sudden death in Dubai late Saturday sent shock-waves through India, was given a state funeral with her body wrapped in the tricolour and a gun salute by the Mumbai Police. Sridevi, Indian cinema’s first woman superstar who straddled the parallel worlds of southern films and Bollywood, became an actor when she was only four years old. Three hundred films later, the doe-eyed star is still remembered for her comic timing, vivacity and her quicksilver expressions. Everyone who has seen her movies, young or old, has been in love with her, said 50-year-old Anand Raghunathan, who had come all the way from Madurai for a last glimpse of his screen idol. Sridevi’s funeral procession was the biggest Mumbai had seen for a Bollywood star since Rajesh Khanna in 2012 and perhaps the biggest for a woman, said old timers. There was a sea of people as far as the eye could see. The last rites were conducted by her filmmaker husband Boney Kapoor as her family and close friends from the industry and outside packed into the Vile Parle Seva Samaj crematorium. The couple’s daughters, Jahnvi and Khushi, were by his side, sources close to the family told PTI. In a statement after the funeral, the family requested for privacy. “The past few days have been trying times for us as a family. Today, particularly, has been one of the hardest. We laid to rest a beautiful soul who has gone too soon,” read the statement. It asked the media to respect the privacy of the family and to give it space to grieve. “Let us all who loved Sri, envelope her two little ones, her life, as she often called them, with as much or more love than we gave Sri so that they can live their lives ahead with a little less ache in their hearts, it said. At the crematorium, few could hold back their tears as the mortal remains of the star through the ages were consigned to the flames. The actor’s body was draped in a red kanjivaram sari with a bindi on her forehead. Ceremonial gun shots rang out and the pyre was lit. She lay there, beautiful in a red saree, serene in death & totally at peace,” actor Hema Malini said on Twitter. Fans and the media were kept out of the cremation ground. There was mayhem with thousands of people, including star-gazers looking to freeze the moment on their phones, blocking the road leading to the crematorium. 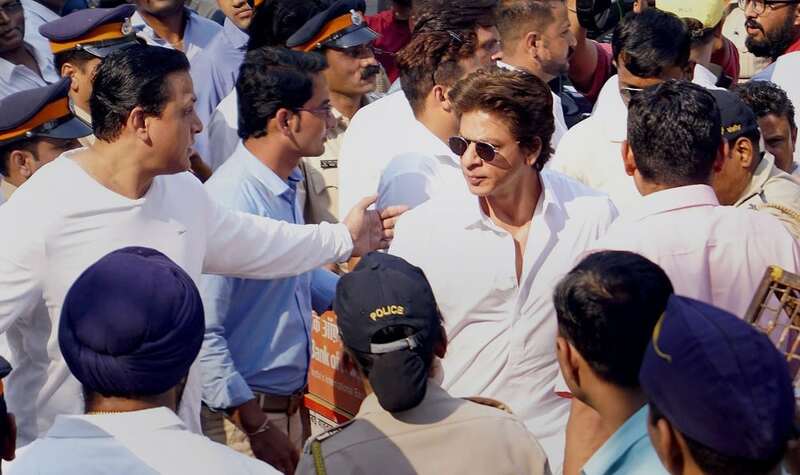 Many celebrities such as Shah Rukh Khan and even Boney Kapoor’s niece, actor Sonam Kapoor, were forced to get off their cars and walk the distance. Mourners in the crowd, some with flowers and pictures and others with just a prayer on their lips, said they were still trying to come to terms with the suddenness of her death in a hotel room in Dubai, where she had gone to attend a family wedding. There were men, women and children and even the old, desperate for a last glimpse of the actor, who had mesmerized them in films as diverse as “Moondram Pirai”, “Mr India” and “English Vinglish”. As crowds mobbed the vehicle — with some climbing on trees and clambering on gates to get a better look — her stepson Arjun Kapoor requested them with folded hands to let the funeral procession pass through. Sridevi’s body was taken to the Celebration Club at 9 a.m. by her family members. Inside the hall, her family, including brothers-in-law Anil Kapoor and Sanjay Kapoor, stood in a corner. Jahnvi and Khushi were standing a little behind them. A red-eyed Boney Kapoor was in a corner, surrounded by family and friends. Fashion designer Manish Malhotra broke down and was consoled by film-maker Karan Johar, who was also unable to control his grief. Rani Mukerji, a close friend, sat near the body. A prayer was performed before the actor’s body was taken for the last rites. While the gates for the general public opened after 10 am, fans from across the country had started queuing up to pay their last respects to the star since 6 am. The body of Sridevi was flown back to Mumbai last night after the Dubai authorities determined that she had accidentally drowned in her hotel bathtub.